What’s your first memory of childhood? Snuggling with a stuffed teddy bear? Blowing out candles at your birthday party? 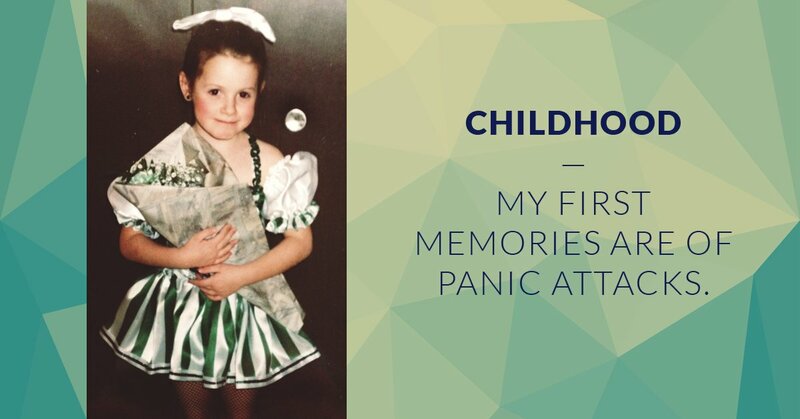 My first distinct memories as a child are of panic attacks. I remember sitting in a parking lot, wearing a tutu, leaning against my mom’s shoulder and sobbing uncontrollably. I remember her trying to comfort me, trying to ask me what was wrong. And I had no idea. I remember not being able to sleep. I remember feeling like the walls were closing in on me. I remember my ears ringing and my body shaking. I remember having obsessive thoughts of death. In church, I was taught that people were in control of their thoughts and actions. But, the harder I tried to control the way I was feeling, the worse I felt. So every night, before I went to bed, my mom and I would pray for God to take the bad thoughts away. When I would scream for my mom in the middle of the night, she looked scared too. As I got older and started attending elementary school, the panic attacks became less and less frequent, and my parents and I pretended like they never happened. When I was 13, I finally had some understanding of what had been going on inside my head after my uncle lost his life to suicide. But, because of the stigma, people didn’t talk about how he died like they would have if he died from a physical disease like cancer. Instead, the cause of his death was talked about in hushed tones and, even today, not everyone in our family knows how he died. People in our family called my uncle selfish and said he was going to hell for what he did. I think that some people are born with a predisposition to depression and that a traumatic event can trigger it. For me, that’s what happened in middle school when my anxiety turned into depression because I was bullied by the other kids in my class. While I was outgoing when I was little, I became an introvert. Approaching new people and making new friends terrified me because I didn’t want anyone else to make fun of me. I didn’t participate in after school activities and, when I got out of school, all I wanted was to go home and be alone. The insults that the other kids would say to me, I started to say to myself. And I began to hate myself. Life got better in high school. Here, I met my best friends. And while I was an introvert to most people because of what happened in middle school, my close friends made me feel like I could be myself and still be accepted. I didn’t come face-to-face with a bully again until junior year of high school. And this was the first time I ever seriously contemplated taking my own life. A boy I secretly had a crush on made fun of me in front of a large majority of our school. I was too scared to confront him face-to-face, so I wrote him a note, telling him how hurt this made me feel and to stop making fun of me. And he passed the note around the school. I heard from a friend that, in his religion class, the teacher — a priest — even read the note aloud, saying, “It sounds like she likes you!” before giving him the note back. As soon as I found out, I left school early. That night, everyone, from friends to acquaintances to people I didn’t even know, were Instant Messaging me, asking me about it. I never wanted to set foot in that school again. This happened on a Friday and, over that weekend, the worst possible outcomes went through my mind. Those were the longest two days of my life, and I couldn’t imagine a future outside of this moment. I irrationally thought I would forever be defined by this painful incident and that, if I was gone, nobody, at least nobody at school, would miss me. My mom knew something was wrong. During this weekend, she hardly ever left me alone, and she put into perspective that, if I did take my life, it wouldn’t only affect me. It would completely ruin her life as well. And, it turns out, like everything when you’re a teenager, less than a week later the other students forgot about it and went on to talk about the next gossip. I’ve had so many different life experiences since then: the happy, the sad, the life-changing. All the wonderful people I have met. And these moments were so close to never happening if I would have let this one embarrassing moment determine the rest of my life. In middle school and high school, I was so scared of being made fun of or of disappointing my parents that I didn’t have many life experiences and I didn’t make many of my own decisions. So, in college, I wanted to discover who I really was. In the midst of this self-discovery and putting myself out there in a way I never had before, the depression subsided but the anxiety returned for the first time since I was a little girl. 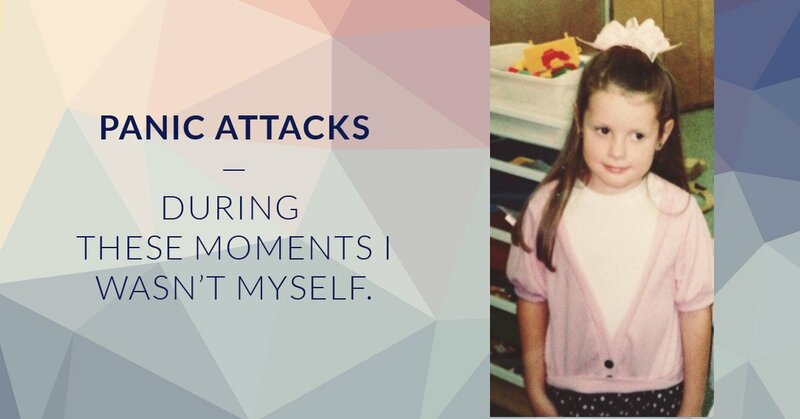 Panic attacks were almost a daily occurrence for me. I still lived at home with my parents and, whenever I had a panic attack, I would hide in my room until it passed. Sometimes, I would hit myself with exercise weights until they left bruises on my thighs or push pins into my skin to try to stop the emotional pain. I was ashamed and I didn’t want anyone to know that this was happening to me again. When I was 19, I went to a counselor for the first time. But, even then, I would fake being happy. I would slap a smile on my face and talk to her about boys and school and not about what was really going on. 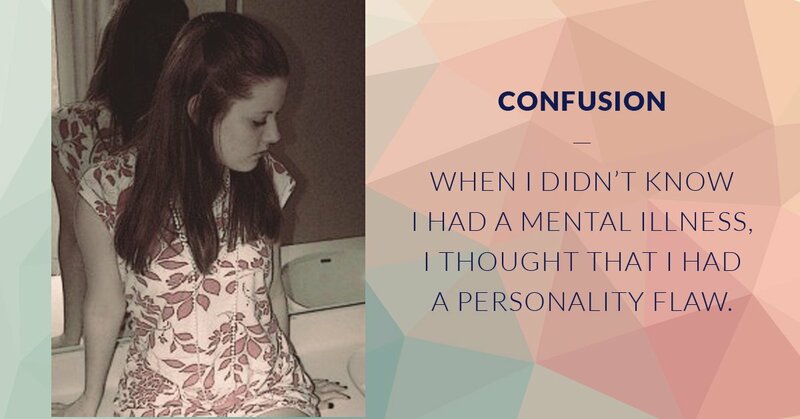 Within a month or two, the counselor told me there was nothing wrong with me. So, in hopes of understanding more of what was wrong with me without having to actually talk to anyone about it, I started taking psychology courses, even though I wasn’t majoring in psychology. And a close friend got me a job working as a receptionist in a psychiatrist’s office. Seeing the patients come into the office with tears in their eyes, they looked like how I felt on the inside. When I would answer the phone at work to a woman or man, crying, asking for an appointment ASAP, I would get jealous that they had the courage to ask for help. And when I would hear other employees call these people “crazy,” it broke my heart because, even though I didn’t tell anyone, I could relate to all of them. My boss could see through it though, and one day, he confronted me about it. He summoned me into his office, and, after I told him about the panic attacks, he diagnosed me with anxiety disorder. And, wow, after hearing that, I breathed a sigh of relief. Finally, after all of these years, I had a name to go with what was going on in my head. Just knowing helped me because, whenever the feeling of anxiety snuck up on me for no apparent reason, I, at least, could tell myself that it wasn’t my fault. Instead of telling myself to “just snap out of it” and “stop being so dramatic” (which only made things worse), I accepted that panic attacks would happen and accepted them like any other illness. Would a person who has an asthma attack blame themselves? So, I decided to no longer blame myself either. The doctor prescribed me anxiety medication and, soon after, I was having panic attacks less frequently. I was better at controlling the disorder. I gained the courage to pursue the career I really wanted — being a journalist. 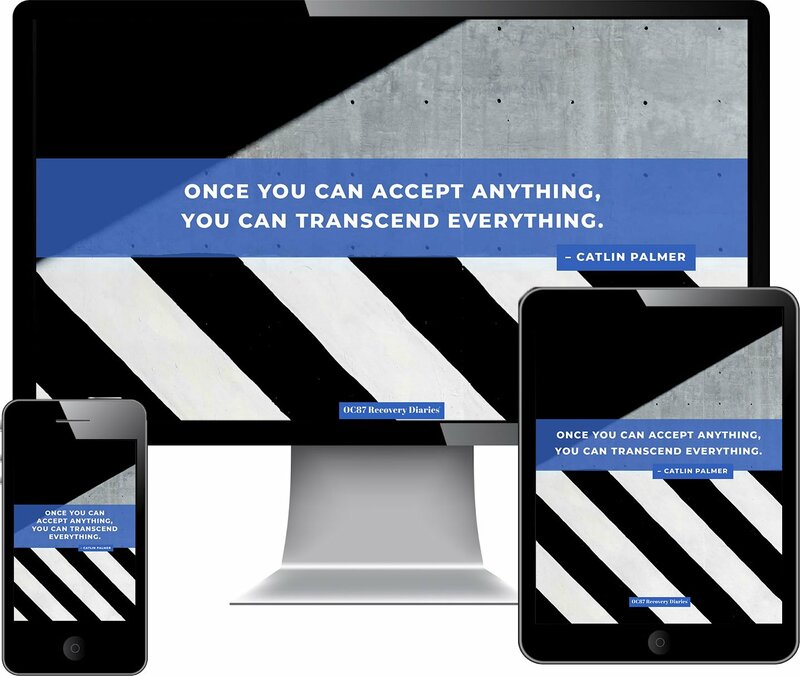 I began interning at a local newspaper — and this really forced me out of my comfort zone. I had to approach strangers on the street and ask them questions. Although, at first this made me feel anxious, this anxiety was different. 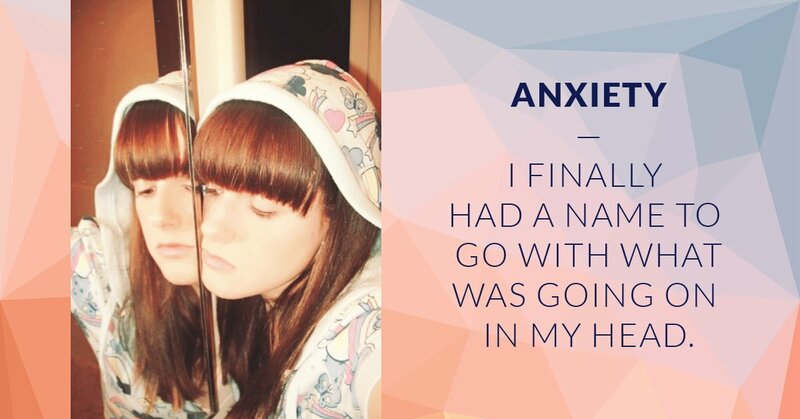 This anxiety was a normal reaction to a stressful event, and not a mental illness. After a while, I began to love reporting. Even in the most stressful situations, this was the least anxious I ever felt. One of the first stories I ever wrote while interning at that paper changed my life. I was assigned to cover a bowling fundraiser put on by a family who had just lost their 19-year-old son to suicide. This was the first time I ever met anyone willing to publicly talk about suicide instead of sweep it under the rug like it wasn’t happening. What his mother said stuck with me. She showed me pictures of this boy who could have been a model. His eyes sparkled and he had a huge smile on his face. 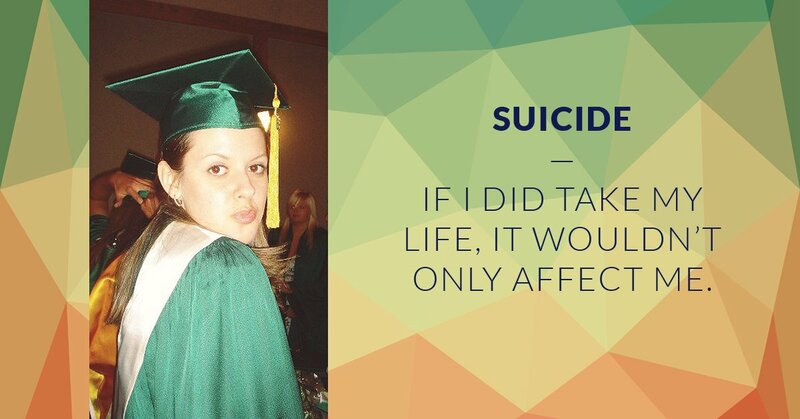 She proved to me that depression and mental illness could happen to anyone. But, even after all of this, I was still too scared to share my own story. 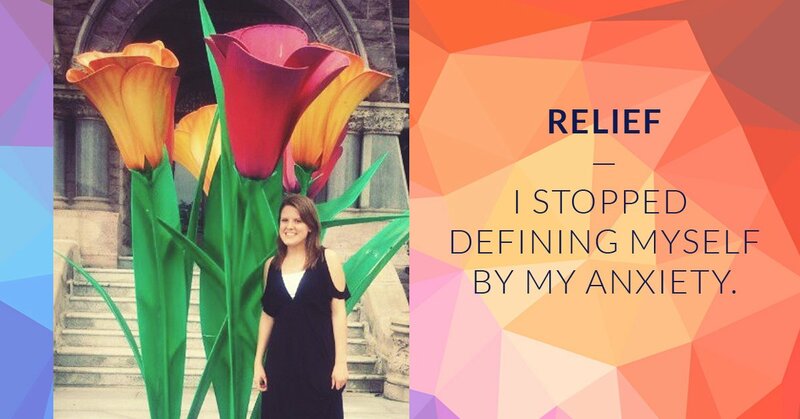 Instead, I decided that I would make it my job to share the stories of others. But I knew this wasn’t true. People weren’t talking about it before, yet it still happened. The articles I wrote in the newspaper were the last articles written about these teens. They wouldn’t have a wedding announcement, a picture of their new baby or grandchild, an article about the opening of their new business or any other lifetime accomplishments. As someone who had contemplated suicide in her life, I knew that if I had read articles like this, I would have felt less alone — instead of more likely to do it. People would call me brave for writing these articles and interviewing these people. When dealing with anxiety and depression myself, “brave” was a word I never thought would be used to describe me. So this meant more to me than any other compliment I could receive. Slowly but surely, my work writing about suicide and talking with others who suffered from mental illnesses gave me the courage to talk about my own struggles. I started a blog where I wrote about what I had gone through. And I remember, when I first admitted to having anxiety disorder on Facebook, for more than 1,000 friends to see, I received countless messages from people telling me that they felt the same way as I did. People I hadn’t seen or heard from in years were thanking me for telling my story and telling me that it made them feel less alone. To remind myself not to be ashamed of my anxiety, I decided to get a semicolon tattooed on my foot — a symbol which has become a badge of pride for those suffering from mental illness. It symbolizes a sentence you could have ended but chose not to — just like you could have ended your life, but chose not to. 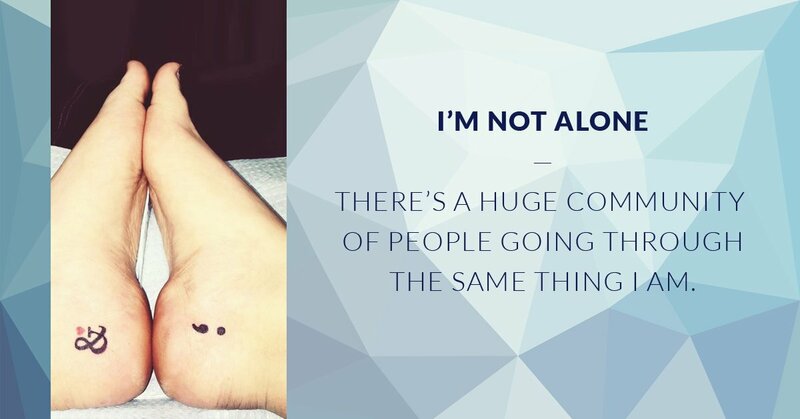 Now, whenever I am having a panic attack, this tattoo reminds me that I’m not alone and that there is a huge community of people going through the same thing I am. It reminds me that, no matter how much pain I’m going through at that moment, it will soon pass. And, as has been proven to me time and time again, life will get better. I once heard of anxiety compared to a superpower. Once I stopped being so ashamed of it, I saw that anxiety was my superpower too. Because of my anxiety, I worked and loved harder. I strived to help others who were going through the same thing. 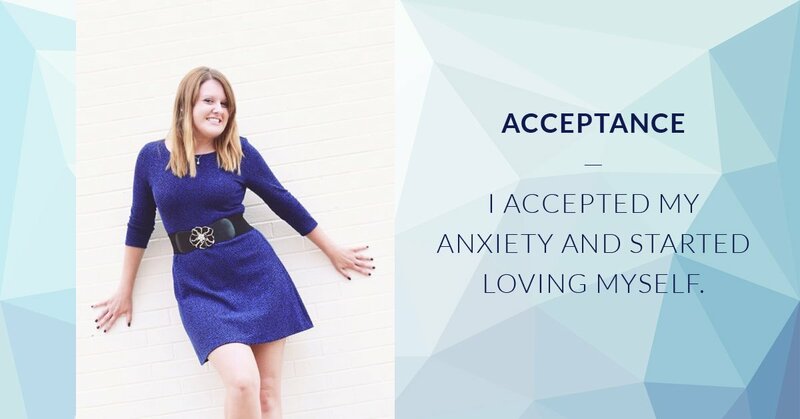 Once I realized that I wouldn’t change this about myself (even if I could), that’s when, for the first time in my life, I accepted my anxiety and, in turn, accepted and started loving myself.